Nine years after journalist and cartoonist Prageeth Ekneligoda disappeared without a trace, investigations have uncovered a gruesome abduction plot allegedly orchestrated by a military intelligence unit operating out of the Giritale Army camp. The case took a stunning turn when two military intelligence officials attached to the Giritale Army camp provided matching confessions before a Magistrate that were told that former Defence Secretary Gotabaya Rajapaksa had allegedly given the command to abduct and later, kill Prageeth Ekneligoda, the Lankaenews cartoonist who had been a fierce critic of former President Mahinda Rajapaksa and his family. Using mobile phone records to link officials working under the Directorate of Military Intelligence at the Giritale Army camp – known as 3 MIC to the abduction, vehicle refueling records and extensive witness testimony, CID investigators led by IP Nishantha Silva, OIC of the Gang Robberies Branch, have been able to piece together the Ekneligoda abduction from Colombo on January 24, 2010, his interrogation at the Giritale camp and his suspected murder and disposal 173 km away in Akkaraipattu, and Ampara two days later. The abduction took place two days before the 2010 presidential election, in which incumbent Mahinda Rajapaksa was contesting his former Army Commander, General Sarath Fonseka for the Presidency. But for the better part of a year, investigators have been hitting a wall as they attempt to secure official documentary evidence from the Sri Lanka Army about mobile phone numbers issued to its personnel, vehicle running charts and leave registers that could be vital evidence in the high profile journalist abduction case. The CID has discovered in the course of its investigations that the Sri Lanka Army pays the bills for the suspicious mobile devices pertaining to the Ekneligoda probe. But the military is refusing to tell investigators which military officers were using the telephones, claiming the records have been destroyed or cannot be released for national security reasons. The CID, which has been pursuing the Ekneligoda abduction case since 2015, have reported several instances of destruction of vital evidence pertaining to the crime and obstruction of justice by the Sri Lanka Army to the Homagama Magistrate’s Court, where a Habeas Corpus inquiry is under way. CID sleuths have also been told by multiple informants that the evidence being sought by the investigators pertaining to the Ekneligoda abduction was being deliberately withheld by the military in order to derail the probe. Investigators are perplexed by the refusal of the military to cooperate, and the inability of the Government to force the cooperation. “We are a State agency, the army is also part of the State. But in all these cases, the CID has to wage pitched battles with the army in court to get information vital to the cases,” a law enforcement official familiar with the case told the Sunday Observer. “In any other Government, the politicians would tell the CID to investigate and tell the military to cooperate with that investigation. But that’s just not happening and so we are constantly on opposing sides in court,” the official complained. The Ekneligoda abduction case was the first to cause major concern at the highest political levels, after 11 Military Intelligence officials were arrested in connection with the crime in August 2015. Evidence points to the assassination of Sunday Leader Editor Lasantha Wickrematunge (2009), the abduction and torture of journalist Keith Noyahr (2008), the attacks on journalists Upali Tennakoon and Namal Perera being carried out by a military intelligence team operating from the Tripoli Army camp in Slave Island. But Ekneligoda was abducted a full year after Wickrematunge’s murder, when the outcry resulting from the high profile scribe’s killing had disbanded the Tripoli outfit, operating under Major Prabath Bulathwatte. The Ekneligoda abduction was, therefore, allegedly executed by an MI team operating out of the Giritale army camp. According to evidence the CID has pieced together and reported to court so far, the tale of how an elaborate abduction trap set for Prageeth Ekneligoda begins in the year 2001, when the journalist travelled to Madhu, Mannar with a Tamil politician who remains a Member of Parliament to date. In Madhu, the politician introduced Ekneligoda to an LTTE cadre known as ‘Thavendran’ an alias for Sumathipala Sureshkumar. Ekneligoda was in regular contact with the LTTE operative, visiting Verugal in Batticaloa at least twice to meet with Sureshkumar following the 2004 tsunami. Years later, Sureshkumar surrendered in the Wanni and was flipped by the army and recruited as an army intelligence operative. In the LTTE cadre’s phone book, military intelligence officials who captured Sureshkumar found a number for the journalist Prageeth Ekneligoda. Sureshkumar was instructed by his military intelligence handlers to continue to remain in contact with Ekneligoda. The MI operative followed orders, regularly communicating with Prageeth Ekneligoda from the Giritale army camp. During Ekneligoda’s abduction in 2010, Sureshkumar’s military intelligence handler was Sergeant Ranbanda. On January 24, 2010 the date Ekneligoda was last seen by family and friends, Commanding Officer of the Giritale Army camp Colonel Shammi Kumararatne – a commissioned officer attached to the Directorate of Military Intelligence of the Sri Lanka Army – called Sergeant Ranbanda and asked to speak to Sureshkumar. In a confession under oath before the Homagama Magistrate, Sureshkumar said Col. Kumararatne had told Sureshkumar that on the orders of Secretary of Defence Gotabaya Rajapaksa, they were to facilitate the abduction of Prageeth Ekneligoda by tricking the journalist into a meeting with an undercover military intelligence operative, Corporal Priyanthakumara Rajapakse Nadan. Once the call from Col. Kumararatne ended, under the supervision of Sgt Ranbanda, Sureshkumar contacted Ekneligoda to set the trap. The same day, a team led by Corporal Nadan left Giritale for Colombo. A series of phone calls between Ekneligoda and Corporal Nadan facilitated the abduction. Ekneligoda’s contact Sureshkumar never heard from or saw the journalist again. Sureshkumar’s confession was corroborated by a matching statement by his handler, Sgt Ranbanda before the Homagama Magistrate. Sgt Ranbanda’s confession helped investigators to pick up the next sequence of the abduction. On January 25, 2010, once Prageeth Ekneligoda had arrived at the Giritale Army camp, Sgt Ranbanda was given orders from his commanding officer Col. Kumararatne, conveyed through a Corporal Rupasena, to interrogate Ekneligoda about several obscene cartoons he had drawn of the then President Mahinda Rajapaksa and his brother, the Defence Secretary. Sgt Ranbanda interrogated the journalist, who admitted to being the artist behind the cartoons which he said had been drawn to expose the alleged corruption and abuse of power by the then ruling family. The interrogation was observed in Giritale by Corporal Rupasena and Corporal Nadan. According to Sgt Ranbanda’s confession, the two corporals left the interrogation room for a while and returned claiming that they had orders from Col. Kumararatne to take Ekneligoda away. Sgt Ranbanda told the Magistrate he never saw Ekneligoda again. The CID has yet to gain access to the two confessions given to the Magistrate. Crucially, mobile telephone records provided by telecom companies have helped investigators to corroborate claims made by both Sgt Ranbanda and Sureshkumar, specifically pointing to their locations, activities and movements from January 24-25, 2010. When investigators questioned Col Kumararatne, the highest ranking military intelligence official arrested in connection with the Ekneligoda abduction, he admitted to travelling to Colombo from Giritale on January 24, 2010 and bringing Ekneligoda back to Giritale the next day. The Commanding officer of the Giritale camp, however, denies that the journalist was abducted, but claims he had wished to travel to Giritale to meet his contact Sureshkumar. Col. Kumararatne told investigators that once they arrived at Giritale, Ekneligoda had been handed over to Sgt Ranbanda’s custody, and claimed he had never seen the journalist again. Soon after Col. Kumararatne made this statement, he was arrested by the CID. Mobile phone records have helped to corroborate that Col. Kumararatne, accompanied by his driver, Corporal Gamage and his security officer Corporal Rupasena had travelled to Colombo on January 24, 2010 and returned to the Giritale army camp several hours later. Corporal Nadan, who, investigations revealed had travelled to Colombo from Giritale and back to the North Central Province army camp with the journalist, has claimed to have no recollection of the events. However, telephone records analysed by the CID have confirmed phone calls made between Nadan and Ekneligoda on January 24, 2010. Once Ekneligoda was taken away from the interrogation room, where the journalist was being questioned by Sgt Ranbanda, there are no more witnesses who can testify to having seen or heard from the journalist again. But investigations found that Colonel Shammi Kumararatne, accompanied by Corporals Gamage, Gunaratne and Rupasena had travelled from the Giritale Army camp on the afternoon of January 25, 2010 to Akkaraipattu, in the east coast. They remained there for nearly 24 hours, returning to Giritale only on January 26, 2010. All four suspects strongly deny having travelled to Akkaraipattu. Denials notwithstanding, investigators have mobile phone records that place Col Kumararatne and his corporals in Akkaraipattu from January 25-26, 2010. The CID has also found records from an obscure army camp in Akkaraipattu which indicated that the vehicle bearing licence plate ARMY-48597 had stopped for refueling inside the camp on January 26, 2010. The driver of the vehicle is listed as Corporal Gamage, who served as Colonel Kumararatne’s driver. The vehicle bearing the ARMY-48597 plate number was Col. Kumararatne’s official vehicle, allocated to him by the Sri Lanka Army. No trace of Prageeth Ekneligoda has ever been recovered in Giritale or Akkaraipattu by CID sleuths so far. Nine years after the journalist’s abduction, CID investigators believe Ekneligoda was murdered by the suspects in Akkaraipattu, and his body disposed of in the same Eastern Province town. The 11 military intelligence personnel were arrested on charges of murder, abduction in order to murder and conspiracy to murder. Investigators and prosecutors believe the abduction and suspected murder of journalist Prageeth Ekneligoda was a ‘politically motivated’ crime. With the investigation facing strong political headwinds and tangible evidence of attempts to suppress and destroy evidence, intimidate witnesses, and subvert justice through violence, the CID is moving to protect key witnesses in the case and preserve the integrity of its investigation, hoping that the case will eventually break wide open, and there will be justice at last for Prageeth Ekneligoda and the family. Thursday, January 24 marks the ninth anniversary of the unexplained kidnapping and disappearance of cartoonist Prageeth Ekneligoda, and in his honour his wife Sandya hopes to organise a religious event with the help of family and well-wishers. 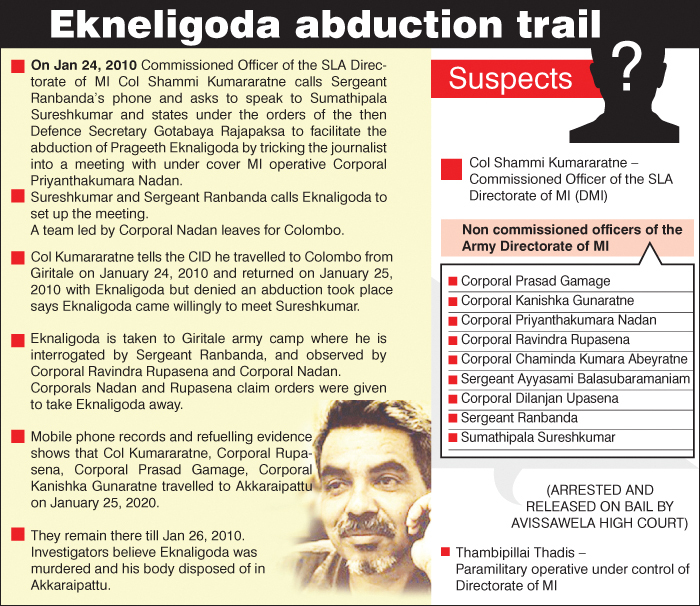 Nearly a decade ago, Eknaligoda who was attached to website Lankaenews went missing under mysterious circumstances. According to Sandya, the last moments Eknaligoda was last seen alive can be traced to army camps in Akkaraipattu and Giritale. Sandya says that the day her husband went missing, he was wearing a white shirt – his son’s school uniform he had borrowed to wear to a Bodi Pooja. Tirelessly continuing her struggle to find justice and embarking each year hoping to find light in a case that has run cold, Sandya – most often clad in a white saree – has become a familiar sight at protests, demonstrations, exhibitions and media conferences dedicated to find disappeared persons of Sri Lanka. The mother of two, now in her mid 50s, who rarely took part in protests before her husband’s disappearance has become a symbol of resilience today. “When Prageeth left through this door that morning (January 24, 2010) he told me that his election campaigning work will end that night and he will help me with my work from the next day onwards,” Sandya said as she sat with the Sunday Observer, looking out her front door through which the cartoonist left, never to be seen again. Ever since, the journey has been a constant battle to Sandya. Targeted by online bullies and shouted at by a prominent Buddhist monk, she appears calm and collected. “But I get scared sometimes. Online they scold me in filth. As if I am a bad woman. All I am doing is looking for my missing husband,” she said. 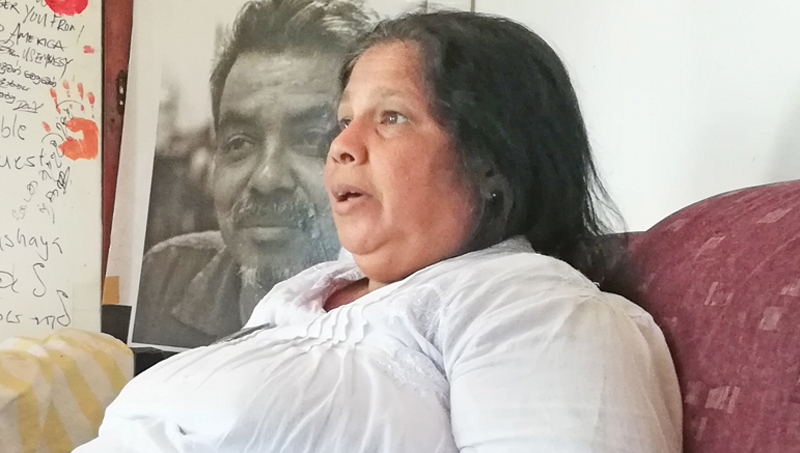 The shock appointment of Mahinda Rajapaksa as Prime Minister last October, Sandya says, was a time when she became particularly fearful. “I was scared for my life. I was scared of my children’s wellbeing,” she said adding that the event would take several years off her struggle to find justice. In January (this month) the ongoing investigations into Eknaligoda’s case was to end ‘naturally’ if the illegal government continued. And, during the brief period the unidentified individuals who stalk, even to date, Sandya increased. Her youngest son feared Sandya will also be abducted. She participated in almost all pro-democracy protests she was invited to in the hope that the developments will change. When the court verdict rolled-back the 52-day government, Sandya felt relieved. She did not attend the victory rally held in Galle Face Green because ‘democracy won, not a political party’. The Rajapaksa family, she said, is after a man who took a pen to his hands. “It is neither a gun nor a sword. Why can’t we find what happened to him even after so many years?” she asked. Just before Eknaligoda went missing he was working on his book ‘Pawul Gaha’ (The Family Tree), which was to contain most corruption the Rajapaksa family was involved in. “Prageeth thought that it was his responsibility to reveal what the former regime did. Before he could finish it he was abducted,” Sandya said. She said her husband got scared when a friend told him that he was the first on the killing list, and asked him to be more cautious. Recalling the fateful night, the second time Eknaligoda was abducted – the first on August 27, 2009 and released the following day – she remembered calling everyone who was to meet and met the cartoonist that day. When he didn’t return she went to lodge a police complaint at the Homagama police, she was told that going missing is a fashion. “The officer told me that Prageeth should be home, while I was at the police station. He refused to record my complaint,” she said. It was finally recorded. Her youngest son went into depression following the abduction. He had to be put on anti-depressants for four years till he got fairly better. But certain incidents still put pressure on the family. One such instance is when, in 2016, Bodu Bala Sena’s Galagodatte Gnanasara shouted at Sandya accusing her of tarnishing the name of the armed forces. “I thought he was coming to hit me. All I could do was run into the court room and tell the judge what was happening,” she said. The monk was found guilty of criminally intimidating Sandya in the court premises. Today Sandya, who lost her job at an insurance company following the abduction, sells rice packets to make a living. Her family and well-wishers help her too.